Lawrence Hargrave - The Inventor Of The Box Kite? Inventor Of The Box Kite? Lawrence Hargrave is the generally accepted inventor of the box kite. His ideas were very influential in the first generation of heavier-than-air aircraft. However, at least one kite academic has thrown in a little doubt, saying 'the idea was already around'. But hey, I'm an Aussie like Hargrave, and hence really like the idea of an Aussie helping to lead the way like this! At least Hargrave's writings provide a clear starting point in history for the construction and flight of cellular kites, and box kites in particular. Engineer. 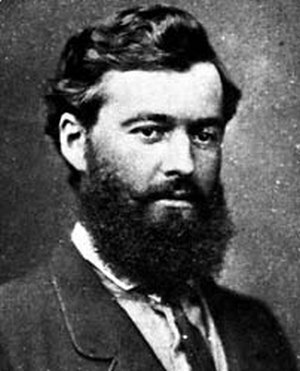 Starting with an engineering apprenticeship in 1867 with the Australasian Steam Navigation Company (Sydney), Hargrave worked as an engineer on several expeditions undertaken by others. Explorer. Hargrave transitioned from engineer to an explorer in his own right, during later expeditions. Astronomer. Not his strongest point, but in 1878 Hargrave became an assistant astronomical observer at Sydney Observatory, and held the post for 5 years. Inventor. Mainly in fields related to flight, Hargrave worked on airfoils, box kites of course, and - are you ready for this? - the rotary engine! Even some early jet engines, powered by kerosene. Aeronautical pioneer. Like others in his time, Hargrave studied the flight of birds and made great efforts to crack the challenge of controlled, heavier-than-air flight. On that last point, I can remember reading a lot about early aviation when I was just a young lad. It turns out Lawrence was in contact with most of the famous people whose names were dotted through those books. For example, Octave Chanute, Otto Lilienthal, B.F.S. Baden-Powell, Alexander Graham Bell, Percy Pilcher, and William Eddy. There's even a photo of Hargrave and Bell together. However, this site is strictly about kites, so let's focus now on Lawrence Hargrave's intense kite-building period during 1893! Before the final perfected design, which you can see in that photo, Lawrence Hargrave went through a lot of ideas and model-making. In fact, quite a number of rubber-powered flying models preceded the more well-known kite experiments! The final Hargrave kite had a number of refinements. The cross braces were shaped to an airfoil section to reduce drag. Just like the stream-lined wing braces of some modern light aircraft. A cord running vertically down the center of each cell could be adjusted to tension up the whole cell, thus keeping the sail panels taut. Two long spars, one above the other, provided a rigid 'backbone' for the kite. Like many modern kites of considerable size, this box kite could be dis-assembled and rolled up for transportation. However, the kite had no bridle, just a simple single-point attachment to the underside of the front cell. Hey, it works fine on very rigid kites! You just have to make sure the towing point is at the right spot. Lawrence Hargrave's progression of ideas started with tubular concepts. The first such design had each cell looking a bunch of short tubes stuffed into a single bigger tube. 6 smaller short tubes to be precise. A long spar connected 2 identical cells. Hargrave flew a paper model of this kite and was pleased with the results. Maybe it wasn't such a great lifter, but at least it was very stable. The cellular kite was born! Next, the smaller tubes were done away with, and the result was 2 large diameter but short length tubes mounted either end of a long spar. This circular type design is still made from time to time, by box kite enthusiasts. You could say it is like a traditional square box kite, but with an infinite number of sides! And of course, just a single longitudinal spar instead of 4. There followed a rather elaborate design with many flat panels. Each cell looked rather like a book-case with the back panel removed. Four 'shelves' with vertical dividers resulted in 16 square sub-cells in both main cells. Again, a long spar joined the 2 cells, with a single bridle line attached to the spar. No doubt it flew, but what a complex thing to build! With the next design after the flying book-cases :-) the appearance of the 2 cell designs started to hint at the final box kite configuration. As in the photo up there. The number of 'shelves' was reduced by one, in each cell. Also, most of the vertical panels disappeared, leaving just the ones on the far left and right sides. Now, the kite was essentially 1 Hargrave box kite piggy-backing another. In other words, 4 horizontal lifting surfaces in each cell, plus the 2 vertical surfaces capping the wing tips. Perhaps there were some problems with the long spar bending, so a 2-point bridle was used on this kite. From here on, several more kites were made, which featured just 2 lifting surfaces per cell. Also, the chord (distance from front to rear edges) of the horizontal panels was extended a lot. Each of these kites looked much like the one in the photo. Lawrence Hargrave was experimenting with proportions. He was trying hard to arrive at the most lifting ability possible, without sacrificing too much stability or adding too much weight. 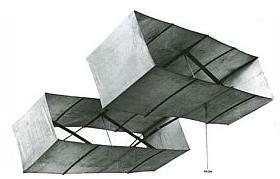 For example, he scaled up one version to compare its figures with a wing flown some years earlier by Otto Lilienthal. It turned out Hargrave's design had a much lower wing loading. In other words, less weight per unit of lifting sail area. At this stage, Lawrence Hargrave was starting to consider how such a kite could be propelled as a free-flying aircraft. He shared his ideas freely with other experimenters, and even had some influence on the inventions of the Wright brothers. 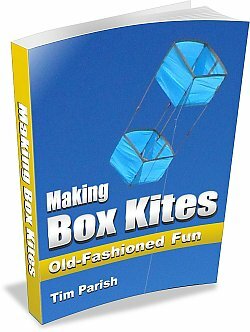 Inspired to make a box kite?